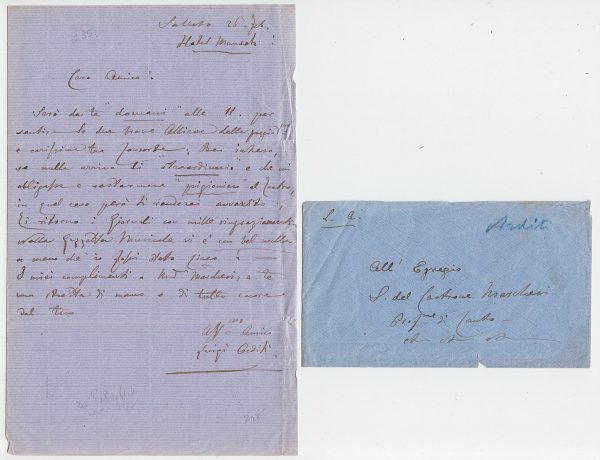 Autograph Letter Signed, to Salvatore Marchesi, “Professore di Canto”, evidently referring to a report in the Gazzetta Musicale and related matters. In Italian. A good one page example, right edge a little ragged,with the original envelope. Saturday, 26 February, no year given. Luigi Arditi (1822-1903), Italian violinist, composer and conductor. Arditi’s best-known operas are: I Briganti, II Corsaro, and La Spia, (“The Spy”). In addition he wrote numerous songs and vocal waltzes.